Have you heard about the most dividing battle in the world today? The battle to determine our future of our basic human rights is at stake. Our voice MUST be heard by those up int he big towers slinging their power as to what WE should believe. You want your voice to be heard? Well, madam, this is your chance! 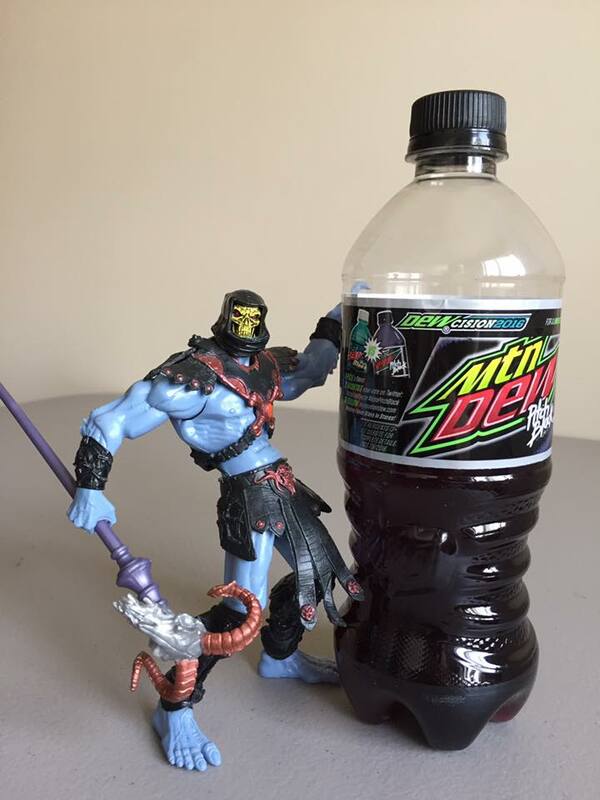 I can only be referring to insane and intense battle between cult favorite Mountain Dew flavors, Baja Blast and Pitch Black. A "DewCision" as they call it. But fans know the deal. This is the chance for Mountain Dew enthusiasts to get their favorite flavor back on the market permanently. Now, I'm personally a Mello Yello fan, but so many of my friends have ranted and raved over the about just how great these flavors are, so even for an outside like me, this was my chance to make up for lost time. For example, I missed out on Pepsi Holiday Spice and I imagine that won't be coming back anytime soon. Well, it may. Who knows, it could be the next Crystal Pepsi and in ten years Pepsi will decide to bring it back. Then again, I could also grow hair, find a time machine and marry Charlene Tilton. A lot of if's there and I personally don't have any stock in any of them happening. Hope I'm wrong though. However, those who love these flavors won't be wrong. 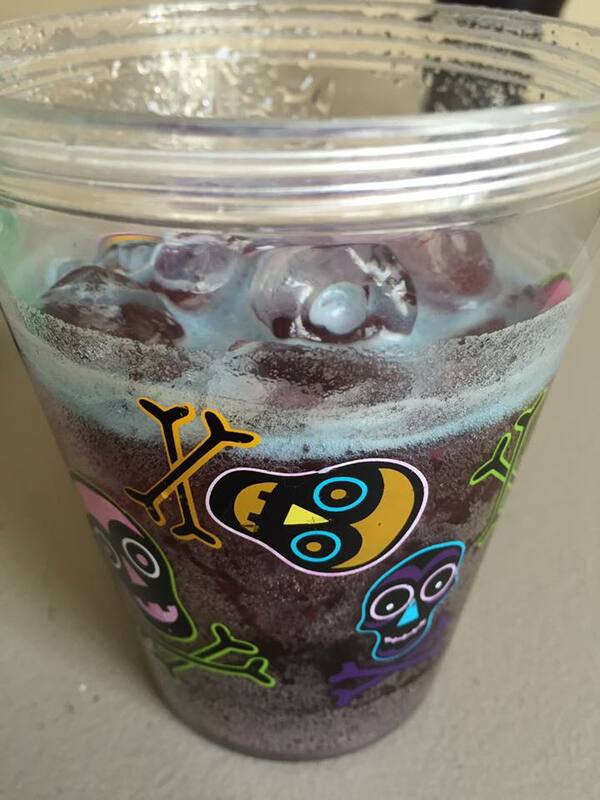 Pitch Black, which was widely released as a limited time offering in 2004 as a special Halloween flavor. Fans went wild. This thing was popular as Lindsay Lohan that year. On the other side, earlier that year Baja Blast was released as a special Taco Bell only flavor. Which worked since Taco Bell and wild flavored sodas went together like peanut butter and marshmallow fluff. In fact, a lot of my friends who just entered college that year or the year before, went crazy over both. 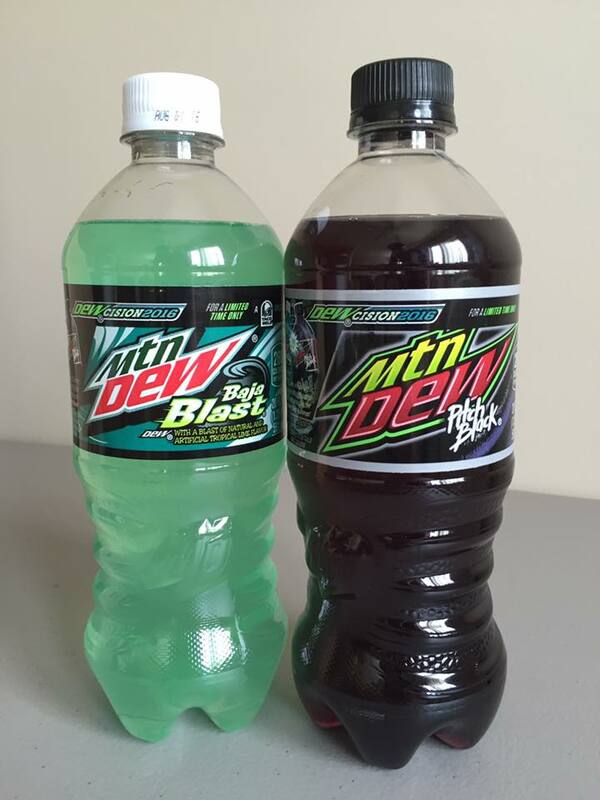 Whether it was a Pitch Black for an all nighter or just a drunken trip to Taco Bell where Baja Blast was their only other means of liquid deliciousness, these were as important to pop culture as the Hilton Sisters at that time. So, if you're a soda fan, and I know a lot of you are, this will be a chance to revisit this. And in addition to Crystal Pepsi and Ecto Cooler, this is a great time for nostalgic drinks. A battle such as this can only called by a fair and balanced referee. Sadly, I couldn't find one, so Two Bad had to be the designated "special guest referee" on the outside while I call the action on the inside of the ring. Obviously Twoson prefers the Baja Blast while Johnny B. Badd prefers Pitch Black. It's gonna be a real rough battle between the two friends, but I'm sure the verdict will be a fair one. First impressions are always important. Sometimes, first tastes aren't always the best way to form a pallet. It takes a while and I gotta be honest, I'm not a fan of overly sugary tasting sodas. But I'm giving it my best here. Which took me a few sips to get into. But, just for kicks, let's take a look at the goods and rate the look. 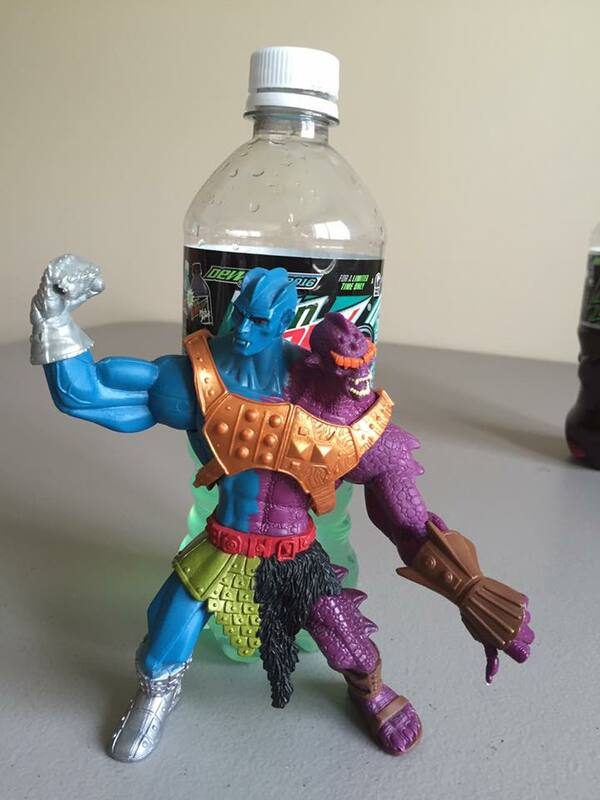 Baja Blast is definitely the most visually pleasing of the two. 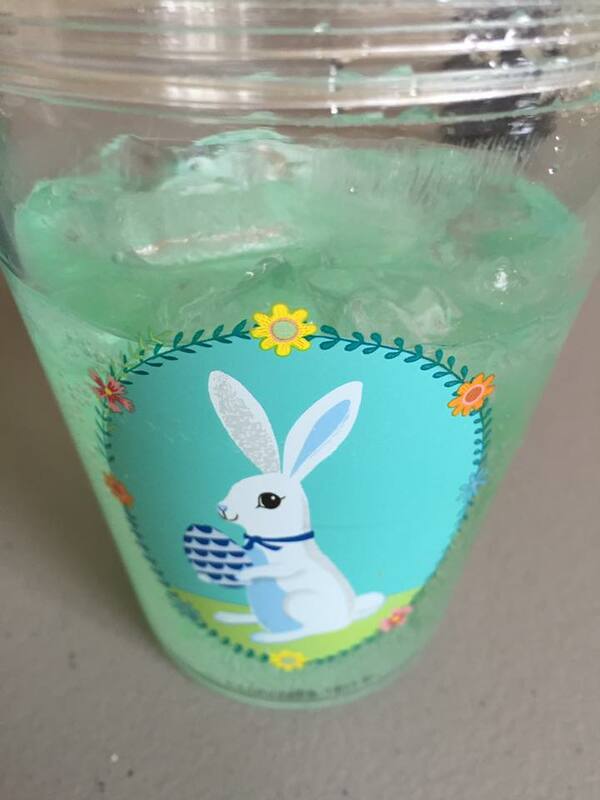 Not just because of the cute bunny on the cup. It just looks like a drink you can sit out on the beach with while you pop your earbuds in, listen to new wave music and read a book. Look at it! It just looks so tasty, despite looking like windshield washer fluid. You better believe I had to put it in a Halloween cup. Only appropriate! 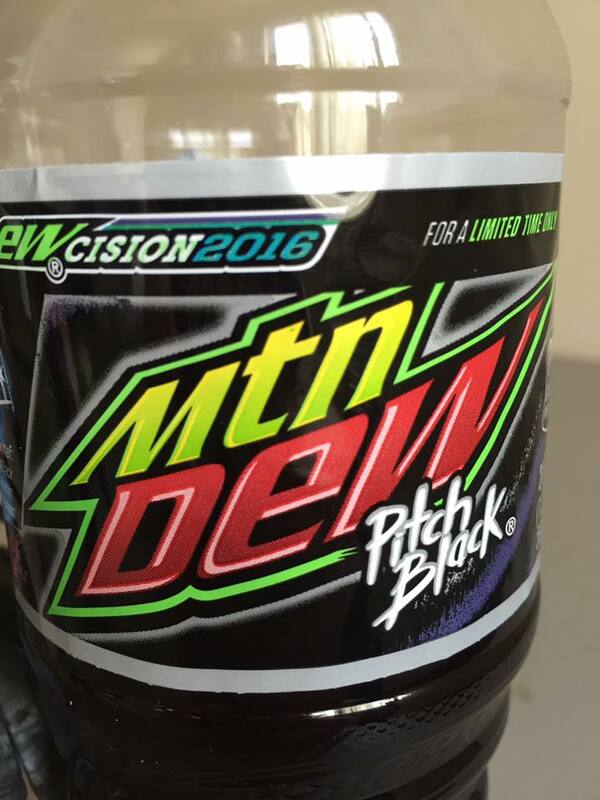 Pitch Black, looks like more of a party drink, which works for it. Or that stuff Jim Jones killed all those Jonestown members with. Either way, I was dazzled by the fact that when it foams up or mixes with ice, it turns blue! Neat! I like that! That's one for Pitch Black! Now the taste! The true moment I've been waiting for. I'm a firm believer that the only way I could've truly gotten the right taste was by having tacos accompany the drinks. I didn't feel like going to Taco Bell and I had a coupon for a free Chipotle taco order. So here it is. The whole enchilada...or tacos and nachos..So down the hatch it goes. I gotta admit. If we ARE going off first tastes, Pitch Black would've won. 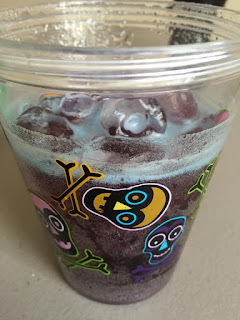 Keep in mind, I'm no fan of grape flavored sodas but it was good at first. 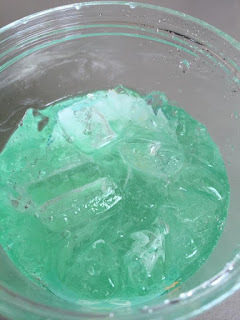 Then I took a few seconds and sipped on Baja Blast and wasn't blown away at first. Back to Pitch Black. Take a few sips. It definitely tastes the more intense of the two after a while. 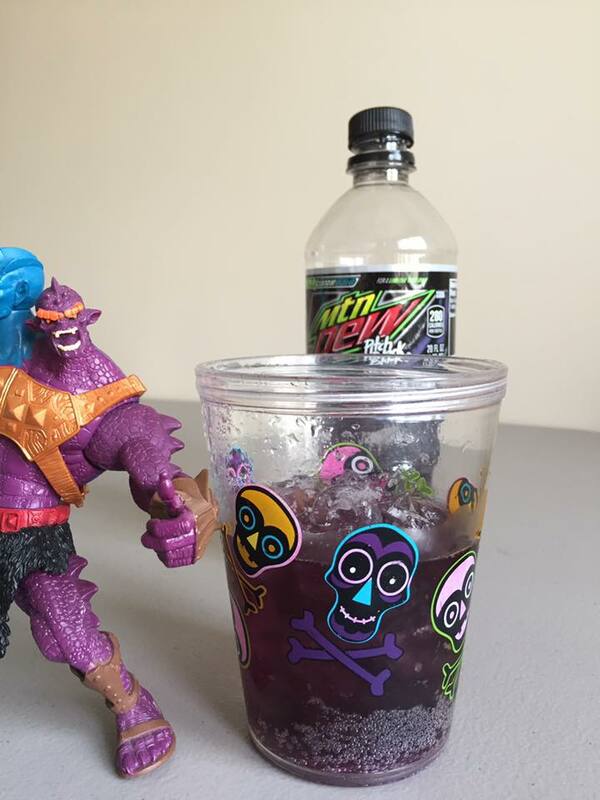 It's got more a of a sugary taste than Baja Blast, that's for sure, so that's what started my distaste for it after a while. Which is weird since I've heard others say that Baja was the more sugary of the two. I guess not having these before kinda hurt me in that regard. Inexperience could've played a hand in this but I guess not. 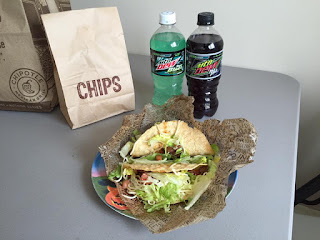 Baja, on the other hand, seemed to be the more subdued flavor. Which for a soda, can't always be good. It tasted better in my opinion after a while. I sat for a few minutes and really thought about it. Which is weird, no one should just sit in their kitchen pondering what's the best soda after about 5 minutes. I spent more time thinking about what was better than I did what I was gonna do after school. But here I am, 14 years later, contemplating sugary drinks. Take that, guidance counselor! 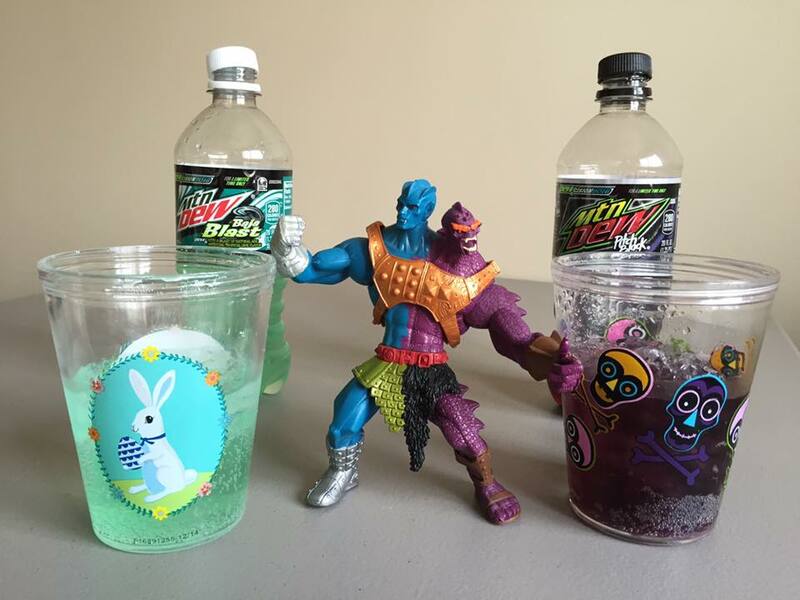 So, in essence, Baja Blast takes the win. But, not by much. I gotta admit that after a while, both drinks made me feel nauseous. Like, watching Garbage Pail Kids nauseous. You know what's that like. You can't watch that movie without wanting to vomit. And after two Mountain Dew drinks, I feel like I could start hugging my toilet. Maybe I'm just a lightweight. I guess I'll stick Diet Pepsi, if I chose to drink or even ingest any amount of sugar again. Thankfully Twoson stands by his pick but not entirely in an arrogant way. I'm sure he would've loved nothing more than his best friend, Johnny B Badd, to have the victory as well. Or even better yet, a draw. But, sadly, in a war such as this, no one truly wins. Except dentists. Which, I'm sure I'll have to call after this afternoon. He'll be a happy guy after my visit. I'm sure of it. No lollipop for me. Thanks a lot, Mountain Dew. My dentists gives awesome lollipops. Not even those lame cheapo 'pops with the paper ring as the handle. You know the ones. Those sucked. 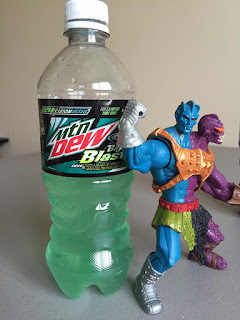 So, my vote is for Baja Blast. But, lets be fair, I'm only one guy. One guy who never even drank it before. So, I can't say I'm as invested into these drinks as others. Judging by the circle of friends that I run, a lot of people will be split down the middle. I certainly hope for fans of these drinks will be happy with the victor of this battle. Because, screw the other "decision" happening this year, this may have more longterm effects. 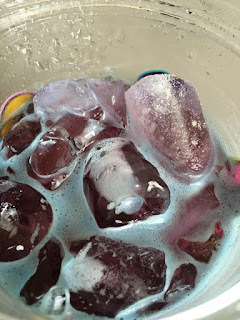 But, I'm sure this won't be the last time we see these drinks. 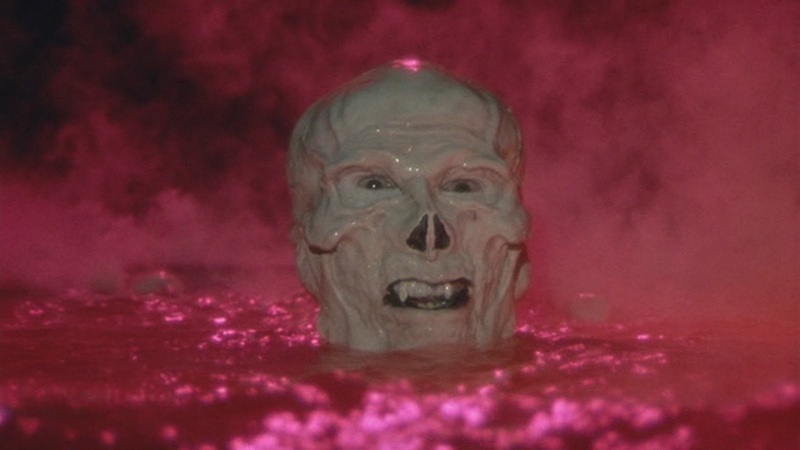 The loser may vanish for a bit, but unlike Skeletor at the end of that Masters Of The Universe movie it'll only be a matter of time until it makes it's much anticipated return. Pitch Black, you are quite the evil fiend! 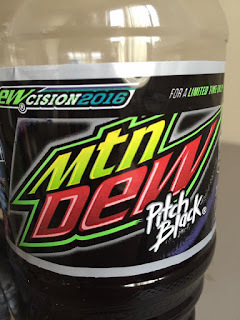 my vote is for Pitch Black! 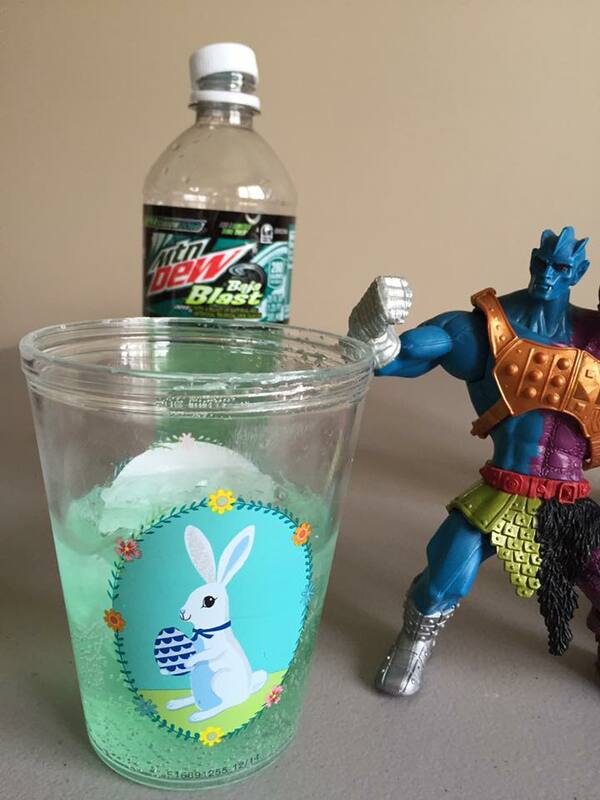 Not much of a fan when it comes to Baja Blast. In fact had a PB today. As a person who is proud to say his favorite soda is Mountain De, I've never tried either of these! The. Pressure. Is. ON.